Elm Wood Stoves are available in two sizes and two body styles. Vermont Iron Stove has made these favorites since 1975. Customers all across America consult us and purchase parts to rebuild them and keep them as trusted wood heaters in homes, camps, and workshops of every description. The latest Elm stoves have kept the classic beauty of the older models, and have incorporated the latest secondary burn technology to give their owners more heat from less wood. 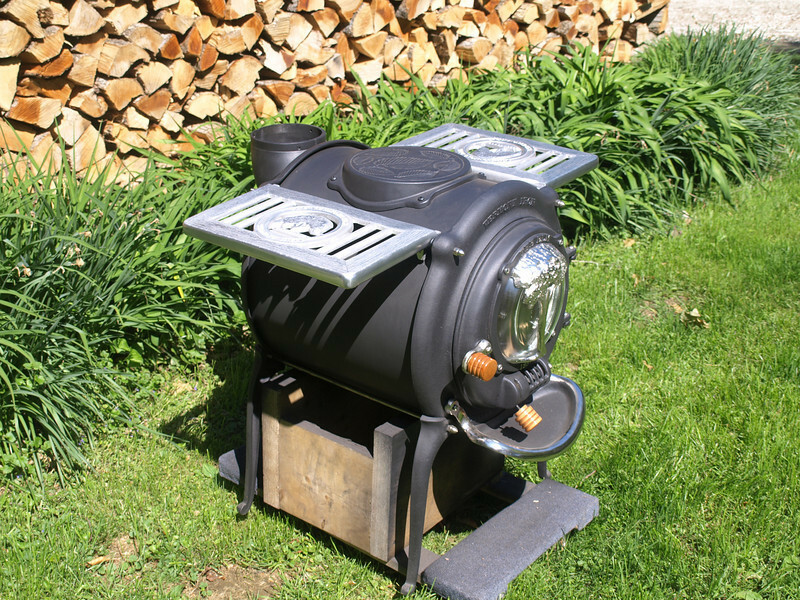 Take a few minutes to view these photos of these stoves as well as our classic park benches. The 18" Clean Air Elm is pictured with polished cast aluminum warming shelves as well as nickel plated Elm tree, ash apron and door handle for a striking high contrast visual combination. Another handsome combination is the Metallic Grey Wildfire Elm with the large square griddle which gets up to 700 degrees F for cooking all sorts of dishes. It is also available with larger warming shelves as well as nickel trim accents. Order your in a classic Satin Black high temp stove paint to go with any of your decorating schemes, with or without nickel stove parts. Features such as long stove legs and the 14" loading door make this an easy stove to load and operate for young and old alike. The simple air intake and the generous viewing window allow you additional ease of operation and the romantic view of the active flames with greater heat output and efficiency than you could get from any open fireplace. Email Steve at bench70@comcast.net or call 802 229 5661 during East coast business hours for more details. Enjoy the gallery and all the views of the stoves and benches!